On August 9, 2017, at age 78, Estelle Coffman accomplished her goal of a bicycle trip in each of the 50 states. She remembers as a kid seeing people travelling on bikes with panniers – those saddlebag-looking packs that hang next to the wheels. How great would it be to see the country by bicycle, she thought. Her mother had always told her that as long as she believed in herself, she could do whatever she set her mind to. That was good advice, because facing and overcoming challenges throughout life prepare you for great things. 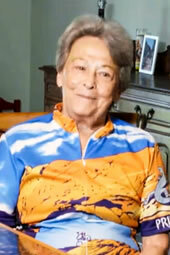 In her 50s, Estelle started riding a bicycle for exercise. When she was 65, she decided to ride from Los Angeles, Calif. to St. Augustine, Fla. A friend went with her – two women on bicycles, taking backroads across the USA. They made it from the Pacific to the Atlantic in 11 weeks. The next year, Estelle did a coast-to-coast trip across the northern states. Then she rode the East and West Coasts. And from the Gulf Coast of Alabama to Canada. It wasn’t long before she’d bicycled through more than half the states. Suddenly the goal of a bicycle trip in every state got closer, more real. If you ask Estelle what the greatest challenge was over the tens of thousands of miles she’s pedaled, it wasn’t the deserts or the rattlesnakes or the loose dogs that chased her. It wasn’t the bad roads or even the bad parts of town. The greatest challenge, she says, was the Grand Tetons – the mountains. But all the difficult parts fade in the face of the rewards: the friendships made. “You meet the nicest people out on the road,” Estelle says. With the mindset of a Champion, Estelle’s advice to anyone getting older is simple: “Keep moving. Don’t stop.” She sure isn’t slowing down. From spin class to swing dancing to 35-mile-a-day bicycle rides, Estelle keeps going and keeps in shape. In fact, she’s about to turn 80, and to celebrate, Estelle’s taking a short bike ride – just 80 miles.